Editor’s note: This post comes to us from Kathy Rhodes, editor, writer, and speaker extraordinaire. I met Kathy in person at an author event earlier this year, was impressed by her knowledge, and invited her to share here. That sentence is like a doorknob. It begs to be turned. The reader wants to open the door and find out what Jimbo did. I’ve always liked that line. It was the first line of a story written by someone in my writers group, and I loved it—maybe because I’m pretty sure action, conflict, and an entertaining story follow. A good opening encapsulates much of the story and establishes character, setting, tone, pace, and voice. For eight years I was editor of an online journal that published 361 writers, some with multiple stories. I saw some good first lines and snappy openings. I saw what worked and what didn’t. And it helped me with my own writing. So what works? What makes an editor know on the first page whether she will like the story? Look back over your work and answer the following questions. 1. Have you opened in scene? Something’s got to be happening. BAM—start with action. We readers will get to know your characters by what they say and what they do. We’ll figure it out, even by what they don’t say, what they don’t do, and their body language. It’s all very showing. 2. Have you given just the right amount of information—not too little, not too much? Let us know what’s going on and where we are, but avoid starting with description or backstory. No facts or flashbacks. Give just enough detail so we can understand the scene in progress. Make sure everything you write pushes the story forward. Overwriting is a common mistake. It is not uncommon for an editor to slash the first page or the first ten pages—too much unnecessary stuff, like the above-mentioned description, backstory, facts, or flashbacks. Favor brevity, compactness, and artful omission. Voice is the expression of YOU on the page—your originality. It’s the unfettered conglomeration of your feelings, passions, beliefs, fears, and attitudes coming through in every sentence you write. It’s your choice of words, it’s the energy you inject, it’s the strong or quirky verbs you use, it’s how you needle your way in, it’s how you bring the story to life on the page. Voice is the key thing that makes your work YOUR work. It makes your material likeable and desirable in general, makes the reader want to stay with it, and makes it luscious to an editor. 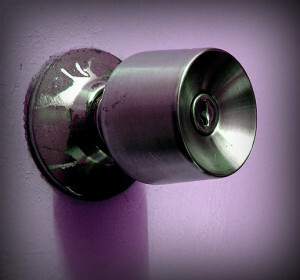 So remember the doorknob when you start your story or self-edit. Turn it just enough to open the door and yank the reader into an intriguing scene, one that pulls him forward both to page two and to the rising arc of a unique storyline. And let the real yousplash all over the page. Kathy Rhodes is author of the forthcoming book Remember the Dragonflies: A Memoir of Grief and Healing. She is also author/editor of three previous books. Her essay, “An Open Letter,” appeared in The Best Creative Nonfiction, Vol. 3 and was singled out for a review in The New Yorker. Her essay “The Wedding Hankie” was included in Chocolate for a Woman’s Soul II. Rhodes is senior writer/editor at TurnStyle Writing, Editing & Publishing Solutions. She teaches creative nonfiction workshops and speaks to grief groups. She blogs at Kathy Rhodes and at Remember the Dragonflies.